You’ve caught me in the middle of eating a handful of this Maple Bacon Popcorn. Let me clean my hands so I can type! There! I’m back! What? Are you asking me if I ate this whole batch by myself? Oh yes I did! I mean, I did give some to my husband, but I pretty much devoured the whole thing. And I don’t have a drop of guilt in my body at this moment. You see, I’ve spent the whole afternoon on the phone with the technical support for my blog because it was acting all funky and not uploading my pictures. So two people had to suffer. Me, for being frustrated because I don’t speak “tech” language and the tech guy for having to talk to me. Blogging can be very challenging sometimes, as it involves many things other than cooking and taking pictures. Many things that I’m definitely not good at… And, to make everything worse, the guy couldn’t fix it and had to restore my blog to October 11th, which was before I posted the Pumpkin Coconut Compote. So not only I would have to repost that, but I would lose all the lovely comments you guys had left me since then! But, thankfully, everything ended up coming back at the end when he realized that that wasn’t the problem and so restored it to last night’s version. And, after that, he finally gave up on me, saying that I would have to contact a WordPress developer. Great! What a waste of time. So I’m incredibly sad and frustrated today… And what’s a good way to cure sadness? Popcorn and an episode of Revenge! (Relax, I’m not plotting revenge against the tech guy… It’s just a show!) But not any popcorn, Maple Bacon Popcorn! 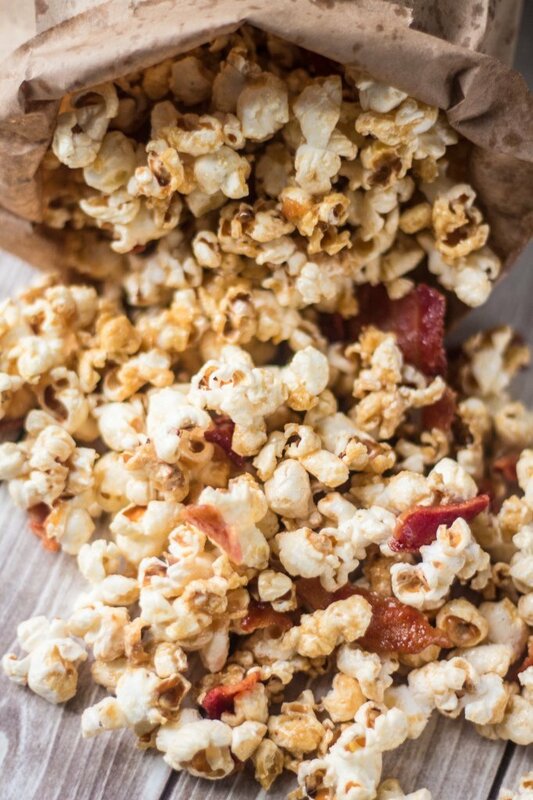 Maple Bacon Popcorn? Does that even exist?, you might be asking yourself. Yes, it exists! And yes it is as good as it sounds! It makes me wonder where this was my whole life!!! How many movies wouldn’t have been so bad if accompanied by this popcorn? And how many lousy dates would suddenly be interesting… Yes, I’m thinking of you, A… Ops! Never mind! I cannot take credit for this idea, though… I was browsing through Twitter the other day and came across this sponsored post from Kettle promoting not only their new Maple Bacon flavored Popcorn but also Maple Bacon flavored Potato Chips! While the chips are too much for me (I like to keep my chips on the salty side), the idea of a maple bacon popcorn hit me instantly and I was all like: “Why didn’t I think of that before?”. So before I even tried their version – I’m gonna! – I recreated mine at home, using tips and bits from several different recipes online. 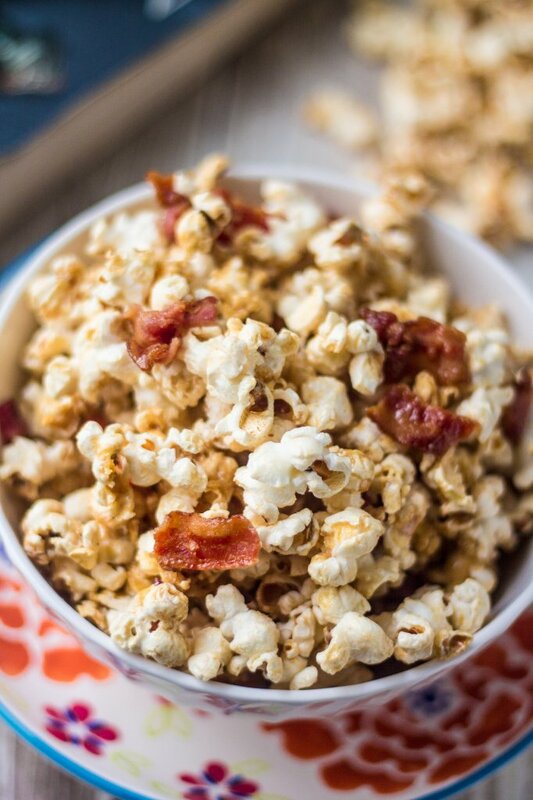 The crispy smoky bacon combined with the maple syrup make this popcorn a buttery sweet and salty perfection. Highly addicting – I literally couldn’t stop eating it – it is like an explosion of all these different flavors happening in your mouth. And by the time you start processing this whole experience, your hands are going for more and more and more! ‘Til the moment you realize you ate it all and didn’t save any for your husband. Ooops! Oh, well! Time to make more Maple Bacon Popcorn, I guess…Let’s see if I can let him eat some this time! Add the kernels to the bacon grease/oil and bring it to medium high heat. When the kernels start popping, make sure you shake the pot every now and then so you don't end up with too many unpopped kernels. Once you don't hear any more popping (or if the intervals are too long), your popcorn is done and you can remove it from the heat. Break the bacon into pieces and toss it with the popcorn. In the same skillet you fried the bacon, bring the butter and the maple syrup to the stove and cook until it thickens slightly. Pour the maple syrup butter into the popcorn/bacon mixture and, using two wooden spoons, mix everything together until most of the popcorn is coated with the maple syrup butter. Sprinkle the popcorn with sea salt and serve immediately! If the popcorn sits for too long, it might get soggy. Maple and bacon we often see in American shows and think its an odd combo (i am in Australia) but seems like a potentially delicious duo, and I think popcorn would add another crunch element to it! Olivia, this popcorn looks absolutely amazing! I love how creative you got with the flavor! Sounds like the perfect snack to me! Not as perfect as those Pumpkin Muffins of yours! God, Im obsessed!!! I’m making them tomorrow! I can definitely see myself devouring a massive bowl of this maple and bacon flavoured popcorn tonight. Good thing I have all the ingredients on hand. Pinned! Thanks, dear! :) Let me know what you think if you ever make it!